Figure 1. Flow Cytometry analysis of human PBMC cells using anti-CD3 antibody (MA1015). 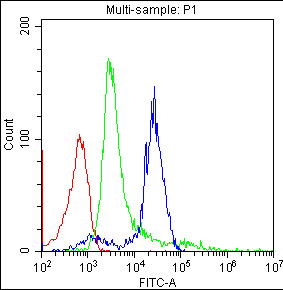 Overlay histogram showing human PBMC cells stained with MA1015 (Blue line).The cells were blocked with 10% normal goat serum. And then incubated with mouse anti-CD3 Antibody (MA1015,1μg/1x106 cells) for 30 min at 20°C. DyLight®488 conjugated goat anti-mouse IgG (BA1126, 5-10μg/1x106 cells) was used as secondary antibody for 30 minutes at 20°C. Isotype control antibody (Green line) was mouse gG (1μg/1x106) used under the same conditions. Unlabelled sample (Red line) was also used as a control. Mouse IgG monoclonal antibody for CD3, CD3e molecule, epsilon (CD3-TCR complex) (CD3E) detection. Tested with IHC-F, ICC, FCM in Human. No cross reactivity with other proteins. CD3E: The CD3 complex mediates signal transduction. The alpha-beta heterodimeric T-cell antigen receptor binds antigen in association with major histocompatibility complex proteins on host cell surfaces. These 2 disulfide-linked glycoproteins, TCRA and TCRB are associated on T-cell surfaces with a complex of proteins called CD3(formerly T3). Human CD3 consists of at least 4 proteins: gamma, delta, epsilon, and zeta. The CD3-gamma/CD3-delta gene pair is within 300 kb of the CD3-epsilon gene and therefore these genes form a tightly linked cluster on 11q23. The clustering may be significant in terms of their simultaneous activations during T-cell development. Chen B, Liu L, Xu H, Yang Y, Zhang L, Zhang F. Exp Ther Med. 2015 Mar;9(3):1063-1067. Epub 2015 Jan 26. Effectiveness Of Immune Therapy Combined With Chemotherapy On The Immune Function And Recurrence Rate Of Cervical Cancer. Xie Zj, Jia Lm, He Yc, Gao Jt. World J Gastroenterol. 2006 Mar 21;12(11):1757-60. Morphological Observation Of Tumor Infiltrating Immunocytes In Human Rectal Cancer. Li Y, Geng S, Yin Q, Chen S, Yang L, Wu X, Li B, Du X, Schmidt Ca, Przybylski Gk. J Transl Med. 2010 May 14;8:47. Doi: 10.1186/1479-5876-8-47. Decreased Level Of Recent Thymic Emigrants In Cd4+ And Cd8+T Cells From Cml Patients. Li Y, Geng S, Du X, Chen S, Yang L, Wu X, Li B, Schmidt Ca, Przybylski Gk. Hematology. 2011 Jan;16(1):43-9. Doi: 10.1179/102453311X12902908411634. Restricted Trbv Repertoire In Cd4+ And Cd8+ T-Cell Subsets From Cml Patients.